This article is not about one destination but about the many different types of camping experience I have found. This has been inspired by the current credit crunch and the cost of doing something special with the family. 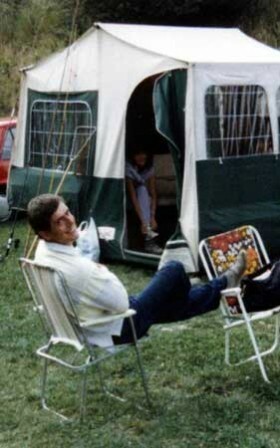 So hi di hi campers, pluck up the courage in our wonderful english summer and take the kids on an adventure.The camp sites I am writing about are listed on my links page. Jollydays which is in North Yorkshire this really appealed to me, cross Enid Blyton with Woodstock and that’s the mix, they have luxury tents with four poster beds, chandeliers and wood burning stoves now that is camping, it is also in stunning surroundings needless to say this was not the cheapest in the high season they are asking about £225 per night but that is for six in style. Yurtworks in Bodmin Cornwall, or I should say looking out across the bodmin moor again this is aimed at the luxury end of the market including a bathroom with rolltop bath, they do some special offers so it is worth checking out. Afton Park, Isle of Wight is a very pretty site, offering stylish yurts and the bell tents which are a little cheaper than yurts. Deepdale Farm, Norfolk, which is not too far from the beaches also offers some simple teepees that the kids would love camping in, their is also an excellent cafe on site. They charge about £102 per night for teepees in the summer holidays that is for 6 people. Now this one is differet Crealycamping Devon, if you book 3 nights on this site you are nominated a miniture pony to look after, you also get to use a heated pool and the theme park whilst there, you must take your own tent to this one, but it does all sorts of treats for the kids. They quoted me a price of £59.80 for a family of four for one nights camping and 2 days entrance to the park thought that was a good buy. Wowo, Wapsbourne Manor Farm, this is the one I was trying to tempt John to go to with me, I found somewhere that John could take his guitar sing to everyone and we would stay for free, thought it sounded brilliant, John was not so keen. This is old fashioned camping at it’s best Saturday night you can jion the hog roast for £3.50, and join the sing along around the large bonfire, they also grow fruit and veg which you can pick and pay for, charges about £8 per adult a night and half for kids. If you fancy any of these have a look at there websites I think it looks a lot of fun and the kids would see it as a real adventure alot of these sites welcome dogs.